By reviewing past incidents, your responses will improve. One of the best approaches to learn how to respond to an anhydrous ammonia incident is to carefully study what others have done. By learning from their experiences your responses will improve and the public will benefit from your knowledge. Below is a list of anhydrous ammonia incidents with a brief summary followed by appropriate links. More incident summaries will be added in the future. On October 31, 2012 at 6:00 p.m. while anhydrous ammonia (ammonia) field application assembly was making a turn at the end of the field, the hitch connection between the application/toolbar unit and the nurse tank failed. The break-away coupling device failed to disengage, causing the threaded fitting at one end of the withdrawal hose to fail resulting in the air release of ammonia. The video illustrates the ammonia release. At approximately 10:20 a.m. on October 20, 2005, a tanker truck hauling 20 tons of anhydrous ammonia rolled over onto its side just off Highway 169 shutting down portions of the highway and causing the evacuation of local residences in Mankato. Although little if any ammonia released the potential existed and therefore as a precaution a limited evacuation was warranted. Since the trailer was on its side, only a limited amount of ammonia could be off-loaded through the valves. Once up-righted the remaining ammonia was pumped out into another tanker. 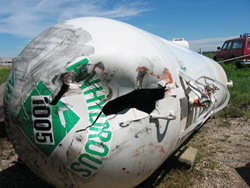 An internal non-code weld had weakened the shell of an anhydrous ammonia nurse tank causing the tank to rupture. The full, pressurized tank was propelled across the facility yard narrowly missing bulk agricultural chemical tanks and buildings as it flew. The tank came to rest approximately 250 feet away after first splitting a tractor in half. An extensive cloud of ammonia vapor drifted away from all major populated areas although some nearby residents were treated for exposure. This tank was manufactured in 1973. 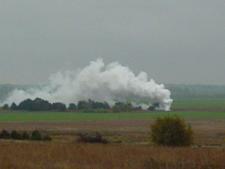 Pipeline Rupture near Kingman, Kansas, October 27, 2004. About 11:15 a.m. central daylight time on October 27, 2004, an 8-inch-diameter pipeline owned by Magellan Midstream Partners, L.P., (Magellan) and operated by Enterprise Products Operating L.P. (Enterprise) ruptured near Kingman, Kansas, and released approximately 4,858 barrels (204,000 gallons) of anhydrous ammonia. Nobody was killed or injured due to the release. The anhydrous ammonia leaked into a creek and killed more than 25,000 fish including some from threatened species. The cost of the accident was $680,715, including $459,415 for environmental remediation. At approximately 1:37 a.m. on January 18, 2002, a freight train derailed 31 of its 112 cars about ½ mile west of the city limits of Minot, ND. Fifteen of those 31 cars that derailed were hauling anhydrous ammonia. A total of 240,000 gallons of anhydrous ammonia released to soil and air creating a vapor plume that covered the derailment site and drifted toward Minot. One resident was fatally injured, 11 people sustained serious injuries, and 322 people, including the two train crew members, were seen by medical personnel. Damages exceeded $2 million and more than $8 million has been spent for environmental remediation. Two 30,000-gallon propane tanks, each at seventy percent capacity were accidentally topped off with anhydrous ammonia. 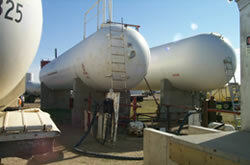 Similar plumbing on both transport and storage tanks made the transfer possible. The galvanized fittings on the propane tanks would have corroded through causing the release of ammonia and propane if not immediately emptied. Compounding the problem was that the individual pressures of ammonia and propane together in a tank are additive which would have caused pressure relief valves to open when the internal tank temperature reaches 70°F.